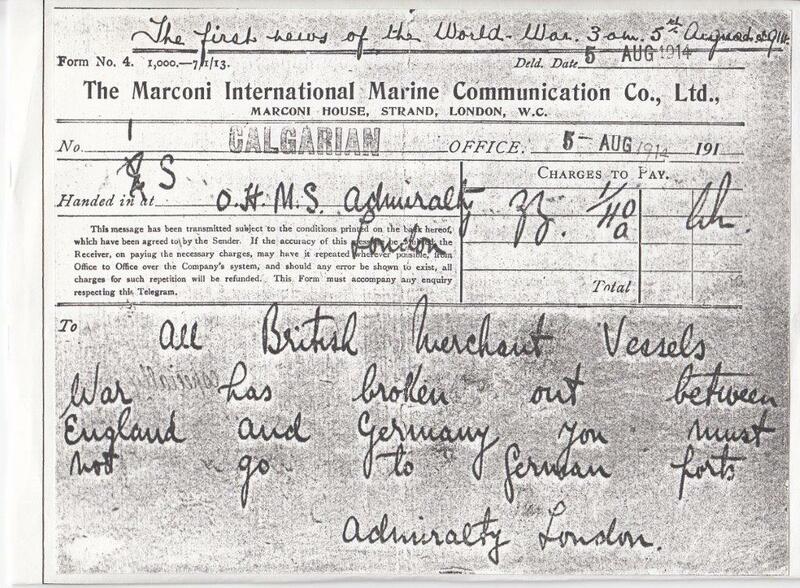 Message sent from the Marconi long-distance wireless station at Poldhu on 5 August 1914 using the callsign ZZ for communicating with ships and received by merhcant vessel SS Calgarian, later HMS Calgarian. 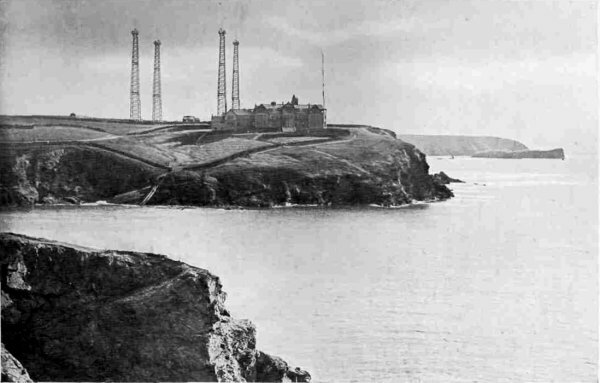 Early on the morning of 5 August, a wireless message was sent by the powerful long-distance Marconi wireless station at Poldhu (callsign ZZ) on behalf of the Admiralty to all British merchant vessels. The message was the first public announcement of war and warned British merchant vessels not to go to German ports. On the previous day, 4 August 1914, the German Army had crossed the Belgian border on their way to France and hence ignored Belgian neutrality. As guarantors of Belgian neutrality, Britain was obliged to declare war upon Germany and her allies. Reports differ as to the actual time that the Prime Minister Herbert Asquith declared war against Germany as it was a Bank Holiday. The following morning, newspapers varied in their times between 7pm and 11pm with the official time of declaration of war between Britain and Germany was probably midnight. As well as warning British merchant vessels, the Admiralty had to, of course, advise ships of the Royal Navy that war had been declared as soon as it was announced. This would have been done both by landline and using its network of shore stations to advise ships at sea. Merchant ships also had to be advised both of the outbreak of war and not to go to German ports. This was done by not only sending the message to the Post Office run coast stations which were in contact with merchant and passenger ships but to ensure it was received out in the Atlantic it was sent to the high powered station at Poldhu in Cornwall. Coast (London: T. Fisher Unwin, 1910), 137. Photograph by Gibson & Sons. Image available in the public domain via Wikimedia. The connection between the Admiralty and the Marconi Company – first established as the Wireless Telegraph & Signal Company in 1897 and later renamed Marconi’s Wireless Telegraph Company in 1900 – dated back to 1896 when Marconi gave early demonstrations of his wireless system to officers from the Royal Navy including one Captain Henry Jackson. Jackson had been experimenting with wireless telegraphy himself and was probably the first person to signal from ship-to-ship using wireless telegraphy. Jackson advised Marconi on adapting his wireless system to make it more suitable for maritime use and supported the integration of Marconi’s wireless system into the Royal Navy, in parallel with the development of his own system. The Marconi Company sent wireless telegraphy apparatus out to South Africa for use by the British Army in the Second Boer War (1899-1902). Atmospheric and geographical conditions as well as the relatively experimental nature of the wireless apparatus meant they were unsuitable for use on land but the wireless apparatus was adapted by the Royal Navy for use at sea and was used to support the naval blockade of Delagoa Bay. This was the first use of wireless telegraphy under wartime conditions. In part as a result of these successes, in 1901 the Admiralty signed an agreement with the Marconi Company to supply wireless telegraphy apparatus for Royal Navy ships and to set up coast stations to receive signals from the ships. This contract was further extended in 1903 and in 1904 the Royal Navy began to use the Marconi wireless system exclusively. By 1908, the importance of Admiralty wireless messages was acknowledged in the “Handbook for Wireless Operators” which noted that distress calls had priority followed by Admiralty messages and then safety messages, also known as danger messages, which were preceded by the Morse code signal TTT. Meanwhile, coastal wireless shore stations selected included “Telegraph Tower” on the Isles of Scilly as well as Culver Cliff, Dover, Portland, Spurn Head and Languard in England, St. Anne’s Head in Wales and Roche’s Point and Bere Island in Ireland. The Admiralty also had hub stations in major locations such as Gibraltar & Malta with a central station in London called “Whitehall Wireless.” In 1911, the central Admiralty wireless station in London was moved to the Admiralty buildings in Whitehall and this was probably used as the communications and receiving centre for “Room 40”, the Admiralty’s centre for naval intelligence including signals intelligence during World War One. To mark the centenary of the outbreak of World War One and to highlight the role of wireless in alerting the world especially shipping to the outbreak of war, a special callsign GB100ZZ has been allocated to a wireless station at Poldhu, near to the former site of the Marconi long-distance wireless station. GB100 callsigns are rare and are only given to mark centenary national events. Active from Poldhu home of GB2GM from 3-30 August 2014. QTH – Poldhu site where declaration of war was transmitted on night of 4 August 1914. Station organised by the Radio Officers’ Association to honour the Wireless Operators who gave their lives in the Great War on both sides of the conflict. This event will be run by the Poldhu Amateur Radio Club from the site of the Marconi Centre. QSL – e-qsl ONLY (unless a sponsor can be found). This entry was posted in Guest posts, Wireless Telegraph and tagged callsign ZZ, David Barlow, outbreak, Poldhu, wireless, world war one on 29 July 2014 by Elizabeth Bruton.